Did you know you could see to infinity and beyond when standing in that torch Lady Liberty is holding? Climbing those stairs during my Junior High class trip made us feel invincible. Oh and then there were the countless times I would go to see Mommy at work in the Twin Towers (era-late 80’s). She worked on the 100 something floor and so I would have to take an express elevator that would take you straight to floor 100 or so and then get on a local elevator just to get to her job. I remember sitting on the The Promenade in Brooklyn Heights staring at the Brooklyn Bridge and falling in love again and again with the skyline of the only city I’d ever known as home. 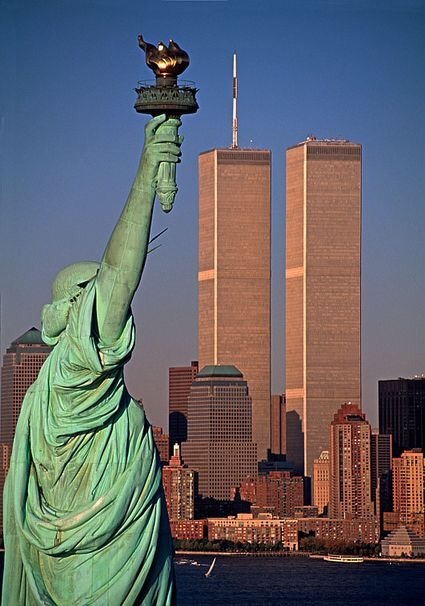 Born and reared in Brooklyn, New York; I choose to remember life pre-tragedy at this moment. I will never forget where I was when the catastrophic & satanically energized tragedy hit and changed ALL of our lives forever. I pray always….not only for those who lost loved ones, and for the families of courageous coworkers & first responders, but I pray for those who can never unsee what they saw. I pray for those who live with survivors remorse, PTSD, nightmares, and fear. Healing to those who remain, blessings & honor to the memories of those who left us too soon. Photo Credits Pinterest. No copyright infringement intended.